Well, it took way too long, but we finally have a verdict in the case of the United States v. William R. Clemens. As was announced this afternoon after ten hours of deliberation by the jury following a multiday break, Roger Clemens is not guilty on all six counts of perjury. 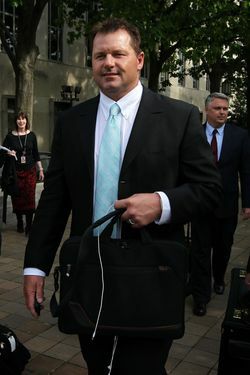 According to the court, Clemens did not lie to Congress about his use of performance-enhancing drugs. The trial is over, and Clemens is off the hook. Bump them fists, Rocket. Cool. Now what? Well, folks who still care about this years after the fact probably haven't been swayed one way or the other. Media entities like Sports Illustrated are asking us if we agree with the verdict (as if we're qualified to provide such an assessment) and whether or not we care. Somehow, I doubt most people's opinion of Clemens's guilt (both as a steroid user and perjurer) changed much with this verdict. Clemens's "legacy" is what it is. Had he been found guilty, it would have tipped more toward the negative. Now that he hasn't, it probably won't change much for those fans engaged in the story. For the rest of us, it's a resounding "no" to SI's second question. And that's really the news here. To most of us, this just felt like a tremendous waste of time, money, effort, and attention. After all these years, a mistrial last summer, and a redundant, mostly uninteresting redo over the last two months, it will finally go away. Roger Clemens is a free man. Good for him.